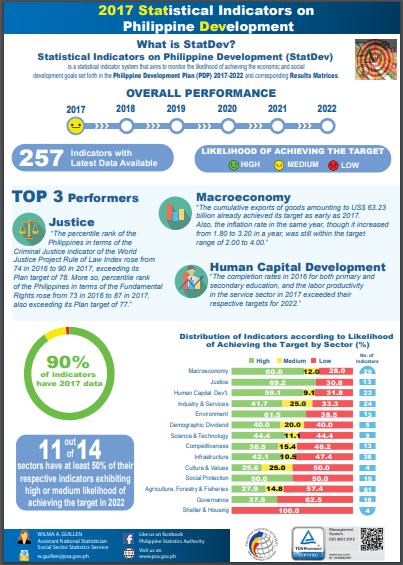 The Statistical Indicators on Philippine Development (StatDev) is an instrument formulated and maintained by the PSA to strengthen the planning system by providing the means by which economic progress and social change can be monitored and measured more effectively. It aims to monitor the likelihood of achieving the economic and social development goals set forth in the Philippine Development Plan (PDP), including the midterm updates. Thus, the StatDev framework is necessarily congruent with the current PDP and is revised each time a new plan is formulated. Updates are collected annually and released every July. 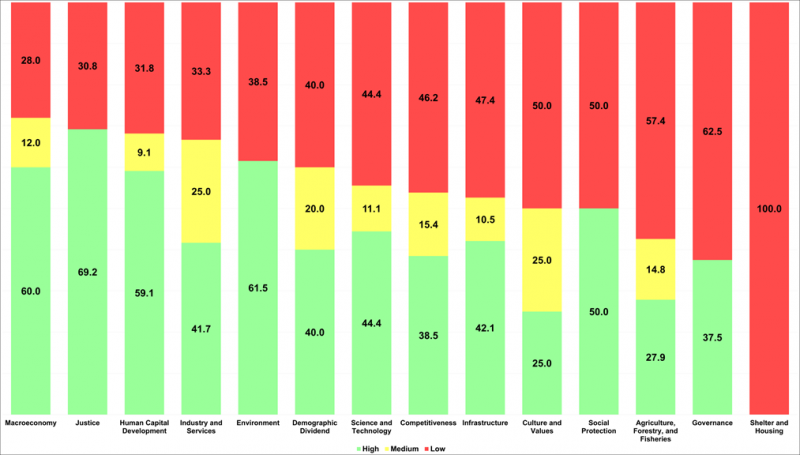 The preference periods of the data vary depending on the latest available data from the source agencies. The data are released on the PSA website along with technical notes and infographics. StatDev 2017 highlights the performance of the indicators covering the 14 publicly available PDP sectoral chapters, with latest available data from the source agencies mostly up to 2017 to as far back as 2015. The PDP sectoral chapters, with the StatDev 2017 indicators showing the likelihood of achieving their respective targets and year of availability, are reflected in the tables and figure that follow.